The Heartland Institute is launching an initiative to save the nation's ailing coal plants. 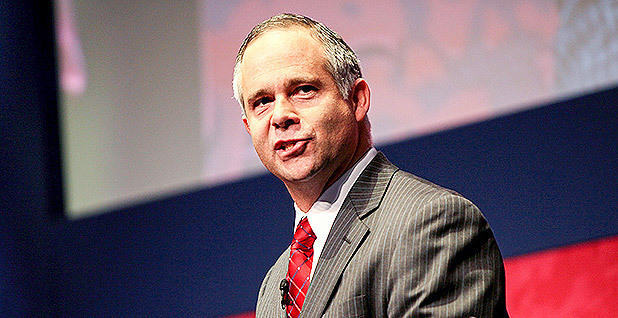 The effort, presented by Heartland CEO and President Tim Huelskamp at the Conservative Political Action Conference yesterday, amounts to the conservative response to the Sierra Club's Beyond Coal campaign, which seeks to eliminate coal from America's electricity mix. "We're going into six different states where the Sierra Club is trying to close coal plants, and we're going in and saying we need those coal plants," Huelskamp said yesterday. Heartland plans to paint itself as an ally of consumers, arguing that electricity costs will soar if coal plants continue to retire at a rapid clip. Officials at the conservative think tank said they would enlist state lawmakers and regulators to prevent aging plants from retiring. "We want to make the future as the past was. We are here because of coal, and we need it going forward," said Fred Palmer, a Heartland fellow who previously worked as an executive at Peabody Energy Corp., America's largest publicly traded coal company. Frozen out during the Obama years, Heartland has some degree of traction in the Trump administration. U.S. EPA reached out to solicit a list of Heartland researchers at the time it was seeking to remake the agency's science advisory boards and considering an attack on climate science. Heartland's coal push coincides with attempts by the Trump administration and industry to bolster coal and repeal environmental regulations. Peabody Energy CEO Glenn Kellow called for a moratorium on coal plant retirements last year (Climatewire, Oct. 4, 2017). Those calls have been echoed by Robert Murray, the CEO of Murray Energy Corp., and were reflected in a recent Energy Department proposal to subsidize coal plants. The proposal was ultimately rejected by the Federal Energy Regulatory Commission. Heartland's effort picks up where those calls leave off. Palmer touted CO2 as a benign gas necessary for life on Earth and attacked Democrats for seeking the total elimination of fossil fuels. "Any Democrat elected to the U.S. Senate will vote with the party on that if they control the Senate. Like Heidi Heitkamp from North Dakota, Joe Manchin from West Virginia, they're Democrats. Democrats are against fossil fuels. They're against fossil fuels. Period." Heitkamp and Manchin are both outspoken coal supporters, making them something of an anomaly in their party. But if Heartland's influence has increased in Washington, the weight of its arguments is on the wane in C-room suites. Power companies have retired a third of America's coal-generating capacity since 2010, according to M.J. Bradley & Associates LLC, a consultancy, and more are on the way. In February alone, two major Midwestern utilities announced plans to dramatically cut back coal generation and replace the retired units with natural gas and renewables. Consumers Energy, a Michigan utility, said this week it will eliminate coal from its fuel mix by 2040. That followed an announcement by American Electric Power Co. that it intends to slash its emissions 80 percent of 2000 levels by midcentury, in part by reducing its coal use. And in Texas, where power generators are retiring some 4 gigawatts of coal capacity this year, researchers expect wind power to overtake coal as the state's second largest provider of electricity next year. Texas is the largest domestic market for coal used to generate electricity. "Coal is taking a 1-2-3 punch in the market," said Joshua Rhodes, a research fellow at the University of Texas, Austin's Energy Institute. The relatively advanced age of America's coal fleet means plants are approaching retirement age. At the same time, grid operators have increasing demand for power plants that are able to ramp their production up and down to match demand. Those trends have been complemented by low gas prices and cost reductions for renewables. "If coal were cheap and gas were expensive, we'd be replacing them with coal plants," Rhodes said. Travis Miller, an analyst who tracks the industry at Morningstar Inc., said there is little doubt it will cost consumers money to transition away from coal. New pipelines must be built to serve gas plants while new transmission lines must be strung to serve wind farms. "The uncertainty is whether it will cost more than coal power plants," Miller said. Anytime a utility weighs further investment in a coal plant, it tries to project the future price of natural gas over the next two decades. "Anything that happens in 20 years is hard to forecast, and particularly commodities," he said. Heartland's efforts are already underway in Missouri, where last month officials from the think tank reached out to members of the state Public Service Commission to request a private meeting to convince them that the Meramec power plant, one of the nation's oldest coal-fired facilities, should stay open (Energywire, Feb. 14). They included a policy paper that portrayed renewables as costly and unreliable and said the state did not need "California-style energy policies." The group argues that it's cheaper for consumers to retrofit the 65-year-old facility than replace its power with natural gas and renewables. Ameren Corp., the plant's owner, unveiled plans last year to invest $1 billion to bring 700 megawatts of wind and 100 MW of solar online by 2025. Heartland's approach in Missouri seemed to be an attempt to subvert the normal process of intervening in the public case to close the plant, said Andy Knott of the Beyond Coal campaign. He said it wasn't clear if Heartland officials understood the process of how to weigh in on the public case in a docket that has been open for months. The group also ignored the utility's economic argument in favor of closing the plant and investing in 700 MW of wind energy, he said. "The economics for coal just aren't working anymore," Knott said. "Coal is not competitive with clean energy anymore, even in Missouri. That's what regulators will listen to." Meramec's case illustrates the stakes for the coal industry. In 2016, the aging plant bought more than 1 million tons of coal from Peabody Energy's North Antelope Rochelle mine and 47,295 tons from Peabody's Caballo mine, both in Wyoming's Powder River Basin, according to federal figures. Continued retirements of plants like Meramec are eating into coal companies' customer base. Peabody estimates that coal demand will fall 15 million to 20 million tons annually over the next five years, as plants continue to retire. In 2017, U.S. coal consumption was 719 million tons. "We will also be continuing actions to preserve coal plants from premature retirement," Peabody CEO Kellow told financial analysts in a recent earnings call. He highlighted Peabody's efforts to keep open the Navajo Generating Station in Arizona. Heartland's efforts will occur in states across the country, said H. Sterling Burnett, a research fellow at the group. But Heartland views the battle as already being lost in places like California and New York, and will focus on saving plants in states where they have a chance to survive, he said. "That doesn't mean we're going to every state, because some states are already lost causes or don't have much coal at all. We're not trying to go into California and say, 'Start building coal plants,' but I think what we are doing is fighting to keep viable coal plants alive, and wherever that is an issue, I think we'll be there." Heartland's focus on state regulators reflects the power dynamics of the U.S. electricity system. Where federal regulators have considerable sway over environmental regulations, the actual makeup of the country's power mix is most often decided at the state level. Heartland officials said they do not plan to directly intervene in utility rate cases, as the Sierra Club has done. The conservative group cannot match the financial heft of the Sierra Club, which has received $110 million from former New York Mayor Michael Bloomberg since 2011, Palmer said. "What we do have is a state and local network, where we can reach regulators, we can reach legislators," Palmer said. "We have a voice, and we have a network, and U.S. mail is pretty inexpensive, and emails are pretty inexpensive, and they're going to get our stuff. They can do with it what they want. We're going to write op-eds, we do that. We'll appear in public, we do that." Heartland, which has received millions of dollars from the conservative Mercer family that also supports the Breitbart News Network, has long been a backer of fossil fuels and has long attacked climate science. Palmer declined to say where the group receives its funding, but he did suggest that its donations for the coal campaign are limited.